The U.S. average retail price of diesel dropped 3.7 cents to $2.976 a gallon, the U.S. Energy Information Administration reported Jan. 14, even as crude oil prices climbed above $50 per barrel. The drop in diesel marked the 13th consecutive weekly decline in the cost of trucking’s main fuel. The price has fallen 41.8 cents during that period. The last time diesel fell below the $3 threshold was March 19, when it was $2.972. Diesel costs 5.2 cents a gallon more than it did a year ago, when the price was $2.924, EIA reported. Average diesel prices fell in all regions of the country, led by the California region, where per-gallon costs dropped 6.3 cents to $3.742. The smallest drop was in New England, 0.8 cent a gallon to $3.208. The average price of gasoline rose 1 cent to $2.247. Regional prices were mixed, rising in four areas and declining in five. A winter storm whipped across 30% of the nation the weekend before, causing power outages, interstate closures, crashes, fatalities and stranded motorists as the governors of North Carolina and Virginia declared a state of emergency. Another storm was forecast for later in the week. Diesel fuel is sensitive to cold, especially to wax buildup, and, “obviously water is the big enemy. It will freeze and clog filters and lines. Follow your [preventive maintenance] schedule regarding fuel system components, especially with filters,” he said. 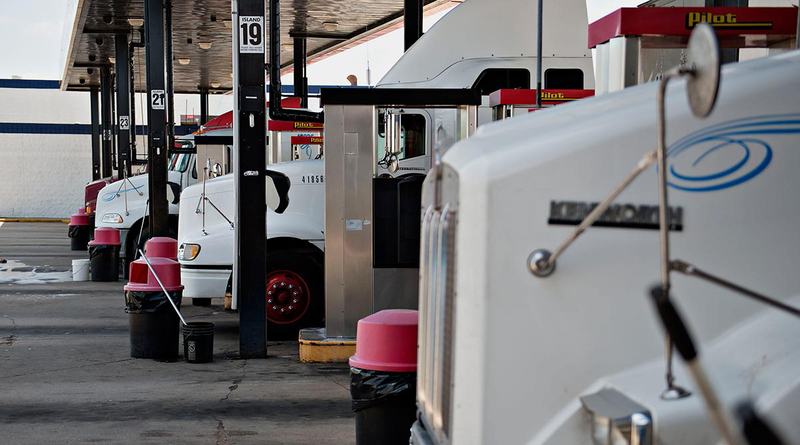 To reduce the introduction of moisture or contamination into your fuel, avoid fueling immediately after fuel is delivered into storage tanks, Legler said. Plus, keep tanks full overnight when there are significant swings in temperature and drain fuel/water separators frequently to reduce the chances of ice formation. Meanwhile, West Texas Intermediate crude futures on the New York Mercantile Exchange closed at $50.51 per barrel Jan. 14 compared with $48.52 on Jan. 7. “In the year that was, WTI crude oil never settled below $50 a barrel — that is, until the very end of 2018. As the equities market staggered lower, WTI and Brent crude oil prices plunged, only to whipsaw higher as the market clawed its way back up,” according to a blog by the Oil Price Information Service. “Still, the damage was done to the oil complex, and the stage is set for a tumultuous year for oil prices,” OPIS wrote. At the same time, China’s imports and exports declined in December, prompting continued fears of slower economic growth. But Saudi Energy Minister Khalid al-Falih attempted to ease market worries, saying that there is little to no impact on the demand for oil from U.S.-China trade tensions. According to EIA, oil prices will remain lower than during most of 2018, but some increase in prices is expected from December 2018 levels in early 2019 to keep up with demand growth and support the increased need for global oil inventories to maintain five-year average levels of demand cover. EIA expects crude oil prices to continue to increase in late 2019 and early 2020 because of an increase in refinery demand for light-sweet crude oil, which is the result of regulations from the International Maritime Organization that will limit the sulfur content in marine fuels used by oceangoing vessels. The agency reported 43% of the cost of a gallon of diesel now is tied to the price of crude oil. For gasoline, crude accounts for 50%. One truck maker recently linked better fuel mileage to a number of enhancements in its latest model. “With all the improvements in the model year 2020 Freightliner Cascadia, we have improved fuel efficiency 35% since we launched the Cascadia in 2007,” said Kary Schaefer, general manager of product marketing for Daimler Trucks North America. The improvements include tow hook covers, an A-pillar deflector, extenders, fairings and wheel covers.